Would you like to make more nutritious vegan milk? We have an easy solution! This recipe came about after reading “The Great Aloe Book” by Alessandro Bassetti and Stefano Sala (Edizioni zuccari, 2007) which is about the history, botany and pharmacological aspects of this legendary plant. This book helped me to understand the nutritious potential of Aloe and we were curious to experiment with it as an ingredient in our homemade vegan milks. Let me summarise why Aloe is so well known in the world of natural medicine. What is the nutritional value of Aloe Vera? It stands out because it contains vitamins A, C, E and some from the B group too. 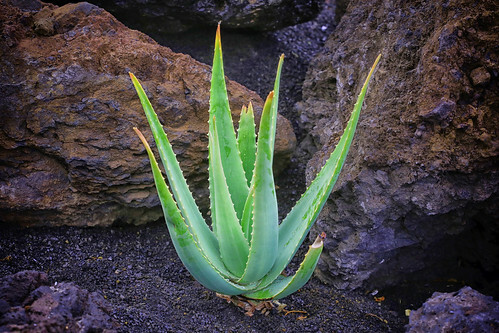 Aloe provides us with 10 minerals which exhibit properties ranging from the constitution of bones and cartilage from calcium to the proper functioning of the cardiac muscle thanks to magnesium, and from the intervention of chromium in glucose metabolism to the strong antioxidant powers of copper. Moreover, Aloe contains 7 of the 8 essential amino acids which are so important for the growth of enzymes, hormones and tissue (especially muscular and epithelial). Thanks to the “cocktail” of substances contained in Aloe it is comparable to the most modern multivitamin, mineral, or protein supplements available. Thanks to the aloin in the gel, it has purifying properties due to its laxative and draining effect. Aloe contains the greatest concentration and most active form of acetylmannan existing in nature, meaning the gel has an immunomodulatory effect, i.e. it hinders the growth of parasites, fungi and bacteria which weaken our immunological system. Another important property is that Aloe is radio protective: the calcium associated with Vitamin A, retinol and beta carotene are a good defence for the epidermal layer against sun damage or any other type of burn. Topical use of the gel has an anti-inflammatory effect, helping to heal and repair tissues. The nutritional components of Aloe are equally distributed between the pulp and the cortex of the leaf, but the latter contains anthraquinones, which give us a very unpleasant organoleptic sensation, due to their bitter taste and sour smell. This is why we peel the plant before putting it in the plant milk and use only the internal gel. Where can I get Aloe gel? The best way to get Aloe gel is to grow our own plant. After two year’s growth, the plant will already have the nutritional properties that we have mentioned in this article. Be careful when buying Aloe gel because there are lots of products which don’t certify that the gel is 100% pure, since when it is peeled to be packaged it is easily destabilised and in many cases the gel is treated with chemical products so that it doesn’t stratify or vary its pH, therefore prolonging its commercial life. What amount can I consume? 25-50 grammes of Aloe gel per litre of milk. Here’s the recipe for hemp milk with Aloe gel! 30 grammes of Aloe Vera gel (without skin*). *Be careful! Only the Aloe Vera gel can be used, as we explained in the introduction to this article. Throw away the water the hemp seeds were soaked in and put them into the filter glass with the rest of the ingredients. Put 1/2 litre of water in the Chufamix container and insert the filter glass with all the ingredients. Beat it with the hand mixer for about 1 minute. When we see that the mixer has squeezed the seeds well, we add another 1/2 litre of water and continue to mix a little more until the mixture is smooth. Leave the mixture to rest for 10 minutes so that the milk can settle. Then, remove the filter glass and with the help of the mortar filter the last drops of the pulp. Put on the lid and keep in the fridge. The milk will stratify when it is resting in the fridge. This means that before serving it needs to be stirred well. You can’t really notice the taste of the Aloe. The milk mainly tastes of sunflower seeds, which is very characteristic of hemp milk. We get the nutrients from the Aloe and hardly change the taste of the original plant milk. This recipe can be used for any homemade plant milk. When the plant milk contains aloe, it doesn’t have as many lumps when heated. Mix in a bowl and eat warm.